South of Bend in the Newberry National Volcanic Monument is a picturesque cinder cone known as Lava Butte, formed nearly 7,000 years ago. Located only 11 miles south of Bend in the Newberry National Volcanic Monument. A hike to the summit provides spectacular views of the Cascade Mountain Range and beautiful central Oregon. Rent a lantern and explore the fascinating Lava River Cave, one of the longest lava tubes in Oregon. Not far from Bend is a popular sight known as Lava Butte. Situated in the Newberry National Volcanic Monument, this spectacular cinder cone came about as the result of a volcanic eruption several thousand years ago. With an elevation of over 5,000 feet, the summit of Lava Butte Oregon boasts breathtaking panoramic views of the Cascade Mountains and central Oregon. Lava Butte OR is just over 11 miles south of Bend on Highway 97. Contact information: Deschutes National Forest, 1001 SW Emkay Drive, Bend, OR 97702. Phone: 541-383-5300 or 541-593-2421(visitor center). Visit the website here. 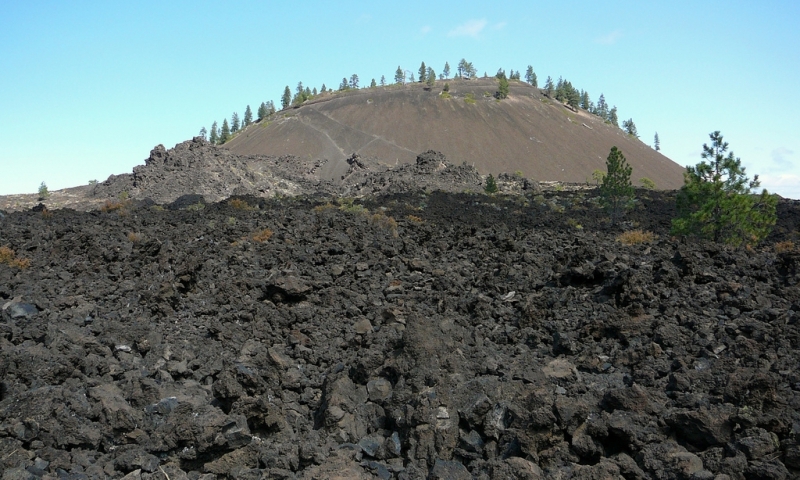 Hiking – Hikers will enjoy the interpretive trail the circles the rim of Lava Butte’s crater. Two other scenic interpretive trails – Trail of the Whispering Pines and Trail of the Molten Land, are nearby. Lava River Cave – This fascinating mile long lava tube is one of the longest in the state. It can be explored with a lantern which can be rented at the nearby visitor center. Boating and fishing - These are two popular late spring and summer activities at East Lake and Paulina Lake, known for their trout and salmon. Lava Butte is actually one of several small cinder cones located on the northwest side of Newberry Volcano. In February of 1933 a ski jump on Lava Butte was proposed, but it was never constructed. Lava Butte is a very popular sight, so access is limited to 30 minutes on high use days. Mt. Adams, one of Washington's most beautiful peaks, can be seen from the summit of Lava Butte.